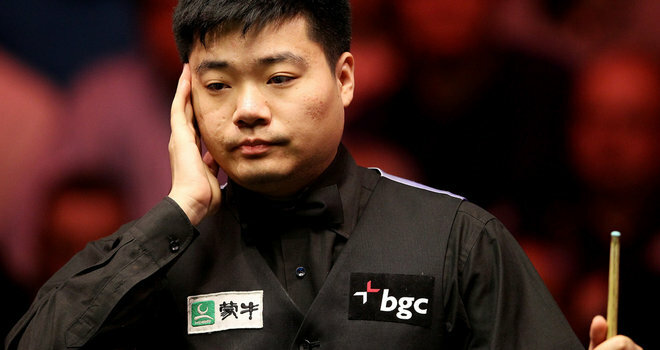 Ding Junhui crashed out of the Haikou World Open in sensational circumstances as he was thrashed 5-1 by wildcard Jin Long. Jin, the 30-year-old from Jinzhou, Liaoning Province, took full advantage of a below-par Ding, growing in confidence as the match progressed. Jin won some close frames in the early stages and reached the interval with a 3-1 lead. A break of 76 gave him the fifth frame and two visits in the sixth secured him a famous victory over the player who had won the Welsh Open just nine days earlier. "I made some mistakes but had a little more luck and Ding didn’t grab his chances," said Jin. "He was feeling the pressure as I led at the interval and I tried to take it easy and try my best. Ding is a great player and hard to beat so I am very happy indeed with the victory." Judd Trump secured a whitewash win over Andrew Higginson and a place in the last 16 as he stayed on course for his second title in China inside 12 months. The Bristol potter took control of the match from the outset and an out-of-sorts Higginson was never at the races. Trump’s top break was a 111 in the third frame. "I think I played pretty well and I know Andrew didn’t play that well so that made it pretty easy for me," said Trump. "I felt good out there and there were a lot of people. It was quite noisy and I didn’t expect that many people to be honest. I had a lot of support so I was happy." John Higgins completed a scrappy 5-3 victory over Marco Fu to also move into the last 16. The reigning world champion looked in for an easy afternoon’s work as he led 3-1 at the mid-session interval, and a run of 70 in the fifth frame put him one away from victory. In the next, on 60 though, Higgins missed a red into the corner pocket and Fu completed a run of 40 to steal the frame and keep his hopes alive. With Higgins looking a little tentative, Fu took the next with a break of 63 before the Scotsman secured the win with a 77 break. He can now look forward to facing Martin Gould or Jamie Cope in the next round. "I was lucky to be 3-1 ahead at the break – the correct score should have been 2-2," said Higgins, who is seeking his first title of the season. "Marco came back very well but I got a good break in last frame to win. I needed lots of luck though, and I’ll have to get a lot better as I’m lacking a bit of confidence. "Marco was a tough match as the Chinese people wanted to see him win so I was happy to beat him this time. My confidence is way down at the moment and you have to start winning matches to get it back." Meanwhile, former world champions Shaun Murphy and Graeme Dott also went through at the expense of Ricky Walden (5-3) and Barry Hawkins (5-2) respectively. Michael Holt hammered Stuart Bingham and Stephen Lee whitewashed Dominic Dale.